MSR dramatically simplifies the VTL turntable mechanical transmission system. In many cases, it is also much more economical. Up to now, the conventional solution for VTL turntable drives has been composed of: a main drive (single motor and output pinion) for turning operations and a separate preloaded gearbox (Dual Pinions) for C-axis drive milling and drilling operations. 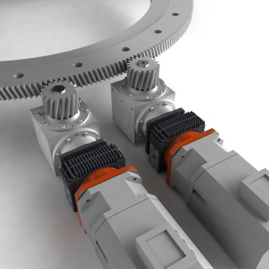 This complex expensive gearbox requires a clutching mechanism to disengage it from the table during turning operations. REDEX ANDANTEX is introducing a new solution to the market. It benefits from new drive and control system technology (for example Siemens CNC or Fanuc). This new drive is composed of two identical gearboxes (twin pinions) sharing the driving torque (50%-50%) during turning operations. Then, during C-Axis operation, the CNC system manages a motor preload torque to cancel backlash. One motor is driving and the other motor is braking enabling very accurate positioning for precise milling and drilling operations without the need for a separate dual pinion gearbox. REDEX ANDANTEX has developed a turnkey solution for this new drive arrangement consisting of a MSD 2-speed gearbox combined with the R SERIES spiral bevel gearbox. This new solution is much simpler and more cost effective when applied to new turntable designs or retrofits for two reasons. First it eliminates the need to develop a complex and expensive gearbox with clutching mechanism for C-Axis. Second the main drive motors are 1/ 2 the size of a conventional solution because they share the load 50/50 during turning operations. The new range consists of 7 sizes with torque capacity at 1 / 2 pinions up to 12,000 / 24000 NM and possible turntable torques from 20,000 NM up to 270,000 NM.